From entrées to share, to lunch and dinner, Grekos’ Restaurant & Steak House of Regina serves up many different specialties Monday through Friday. Browse through our menus below; then, be sure to contact us and make your reservations today. 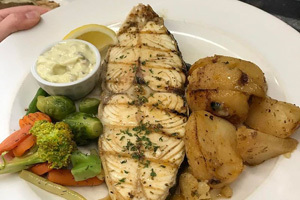 All meals come with your choice of house Greek style salad, garden tossed salad, or Caesar salad; your choice of French fries, Greek fries, lemon roast potatoes, rice pilaf, or a baked potato; and hot seasoned vegetables. Garlic toast is served with salads. Upgrade starter salad to a starter size Horiatiki salad for $5.95, or a Greek salad for $3.95. We only serve aged AAA Canadian beef. All steaks are served with sautéed mushrooms. All lunches are served with your choice of either house Greek salad or Caesar salad, and your choice of Greek fries, French fries, or rice pilaf. Add a small bowl of the soup of the day for $1.50.